Lucy is a fully assembled, ready to plug-in, smoked gold balloon cage table lamp worthy of adorning any side table. Designed in-house here at D&R, this gorgeous cage lamp is perfect for creating a homely, ambient vibe in any space. Behold our fully assembled and ready to go table lamp! These beautiful components have been available to buy independently for some time as part of our lighting components range. But we thought that we’d make your life a little bit easier by showing you how well they work together. Our smoked gold balloon cage is a femininely curved light shade that is perfect for adding a touch of sophistication to your interiors. Completed with a length of gorgeous grey jumper fabric cable that accentuates the smoky hues that drift across the surface of the matt brass cage, this table lamp is something a little bit special. We love this industrial style lamp used as a bedside light in a Scandi-inspired space where it can really be appreciated. This smoked gold and grey combination looks amazing against matt white or barely-there grey walls. Complete the look with crisp white bedding, reclaimed wooden flooring and subtle grey accents in furnishings. Oh and don’t forget those important matching smoked gold switches and sockets! The wonderful thing about this lamp is that it’s really versatile. It can easily be moved around your interiors to cast light wherever you need it. You can even use it as a wall light simply draped over an installed hook, or hang it from your headboard to add instant ambience. Add a vintage filament light bulb for the ultimate vintage vibe. 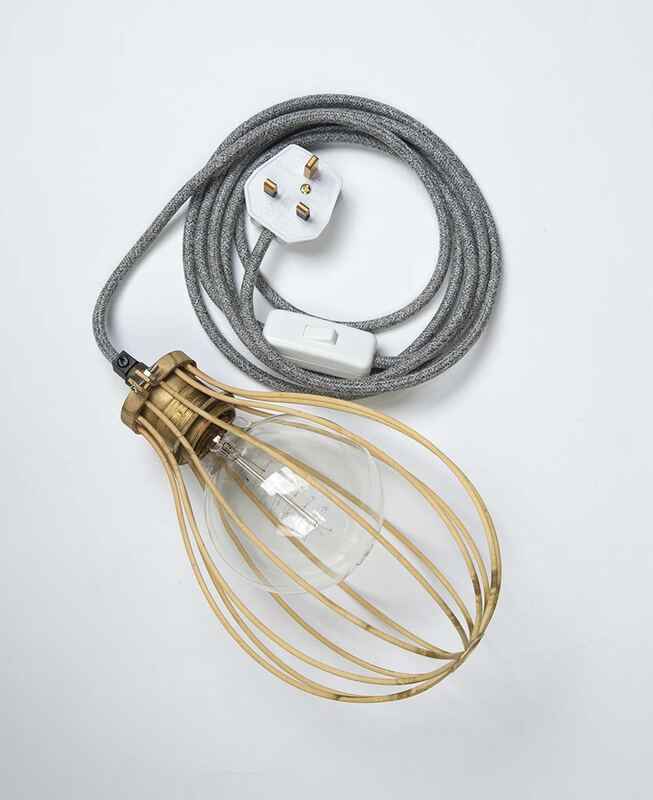 Each lamp is fully assembled with cage light shade, a smoked gold threaded E27 bulb holder, a 3m length of grey jumper fabric cable, clear inline switch, clear 3 amp plug and a medium globe quad loop filament light bulb. Each cage is hand-made and therefore may have tiny imperfections. Each will have unique patterns and colours.